Offer expires 10/12/2014 (11:59 P.M. PT). 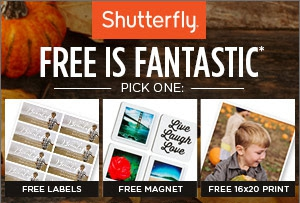 Offer is good for 1 free set of address labels (24) or 1 free magnet of any size, or 1 free 16×20 print through shutterfly.com. Must select one of the three products. Offer cannot be redeemed more than once per account and/or billing address. Taxes, shipping and handling will apply. Not valid on prepaid plans, gift certificates, videograms, cards sent using mailing services, prior purchases, orders placed for in-store pick up, purchases made on the Shutterfly iPhone, iPad and Android apps or Shutterfly Pro Galleries. Cannot be redeemed for cash or combined with other offers or credits. Not valid for resale. It’s one thing to send your loved ones high quality cards, whether they’re for birthdays or the holidays. But the elegant touch of adding customizable address labels will further highlight just how stylish and thoughtful you are. Plus, it’ll save you a ton of time (who writes by hand these days, anyway!?). All customers are eligible to choose between 1 free set (24) of address labels, or 1 free magnet (upload a favorite family pic to your magnet and place on fridge? ), or 1 free 16×20 print (frame your wedding portrait for the office?). Claim this deal by clicking the “Get FREE” button and you’ll receive a free voucher with a promo code for this deal. At Shutterfly, millions of people store, enjoy and share billions of photos. They’re here to help you turn the photos you love into award-winning photo books, meaningful cards, imaginative photo gifts, home decor, personal websites and so much more.